Jon says: While a concept like "Age of Enlightenment Historical Nation-Building Sandbox" might seem like a nice concept - and should be by all rights - Paradox did a fantastic job widening the audience for it. Taking the Holy Roman Empire to a unified German state, or creating a Japanese empire than can resist European colonization, are some of the most satisfying long-term planning experiences you can have in gaming this year. The real-time grand strategy is an odd duck, but maneuvering your armies across multiple fronts, deciding where to siege the enemy and where to flee, and knowing your limits when invading Russia (Hint: You will lose) are the kinds of gameplay that only time and dedication to a genre can bring. This game knows its strengths and plays to them, taking no risks with flashy new mechanics, but simplifying what it must in order to present a strong contender as one of the most finely crafted games of the year. The grand strategy, as a genre, requires the time and dedication. It also requires, more often than not, spending hours on the internet reading about how the game mechanics actually work as opposed to the vague descriptions the game gives about why they're happening to you. Paradox Interactive's Europa Universalis IV took a huge step away from that kind of gameplay, making many aspects of the game transparent and available from menus and tooltips. While there's still a bit of learning to do, the developers have shown consistent commitment to updating and releasing new content - both DLC and free - for the game over time. Greg says: I feel like I've written more words about Enemy Within than I have about any other game this year. Building on the excellent blend of tactics and strategy in the original, Enemy Within adds a plethora of layered choices that make the overall experience richer and more robust. It's not as valuable for every sniper to have the same build, for example, or to rush to plasma weapons at the cost of everything else any more. There's also the danger of a third faction of human terrorists called EXALT, which adds another annoying wrinkle in your crusade to save the world from the aliens. There's more maps and special council missions to play through, and more items to research and build which change your tactics drastically. Not every decision made by Firaxis was a success, but The Escapist editors have collectively spent more than 300 hours playing the game since its launch in November, and that kind of devotion is a testament to the design. 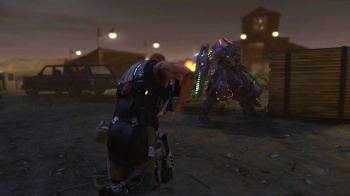 XCOM: Enemy Within may yet have reached the legendary status its inspiration from the 90s series has engendered, but the expansion of the storied strategy franchise is clearly in good hands.